Do you need full car detail in or around Saint Petersburg, Florida? If yes, you are exactly at the right place. Our team of auto detailing experts have experience cleaning and washing every type of car possible, and they know what details to look after for each brand and model. We use special tools to remove the dirt and road grime. Your car will soon look like new or almost. Every single detail, inside and outside, will be taken care of. There are a lot of aspects when it comes to detailing and it can be a challenge to find the right company that will look after each one of them. Fortunately, we have developed the ultimate car detailing service and you don’t have to look for any other company because we strive for perfection in our work. 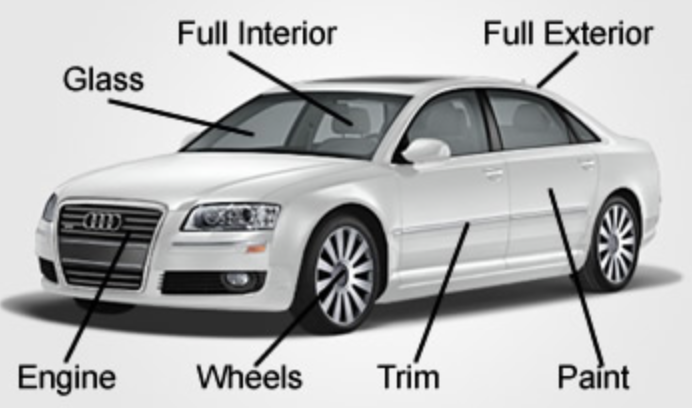 Your car is fully covered by our service, both inside and outside. First of all, paint care is extremely important since it is delicate and protecting your car’s paint surface is our priority. Once the car has been thoroughly cleaned, we apply clay bar in order to get rid of possible contaminants in the clear coat such as tar, particles of all kinds, industrial fallout. Then we can proceed to car polishing. Marks and scratches will disappear this way and finally wax will protect the paint and make your car shine. Once the paint has been taken care of, we can move on to the wheels, chassis, headlights, taillights and exterior trim too. Polishing and proper sealing are absolutely necessary for the latter. Cleaning the chrome trim and polishing exhaust are part of the package we offer. For the former, we will thoroughly clean the undercarriage and the chassis. Your tires will be washed and plastic protectant will be used for your inner fender liners and splash guards. Say goodbye to corrosion, cracking, and say hello to renewed luster! Not only do we pay attention to outside car detailing but we also clean with great care the interior of your car. All your carpeting and seating surfaces will be perfectly clean once we are done. But this is only the beginning and the bare minimum: your leather, plastic, vinyl surfaces will also be cleaned. We will not forget the trunk area either. It is all part of our full detail package. Car detailing is rather cheap compared to all the benefits it brings. For a few dollars, you can purchase a service that brings real value to your car, and to you by the same token. Driving a clean and shiny car is always a pleasure. Call us now at 727-222-4511 for more information on our service. Our mobile auto detailing specialists are ready to answer your questions and share their knowledge with you. Whether you are looking for full auto detailing, interior detailing, or exterior detailing, you can book directly over the phone with our operators.